11 Cute Fairy Wall Murals and Fairy Wall Decals for Girls! 11 Cutest Fairy Wall Murals and Wall Decals for a Magical Girl’s Bedroom! Are you looking to create the most magical and enchanting fairy bedroom for your little girl? They will make her bedroom look just like a magical fairyland! *Here we have all her favorite Disney fairies together flying and hanging out with a cute ladybug among beautiful flowers on their Fairyland! It looks gorgeous on the forest green painted wall! This is the largest size possible (my favorite) but you can also get it in two smaller sizes. 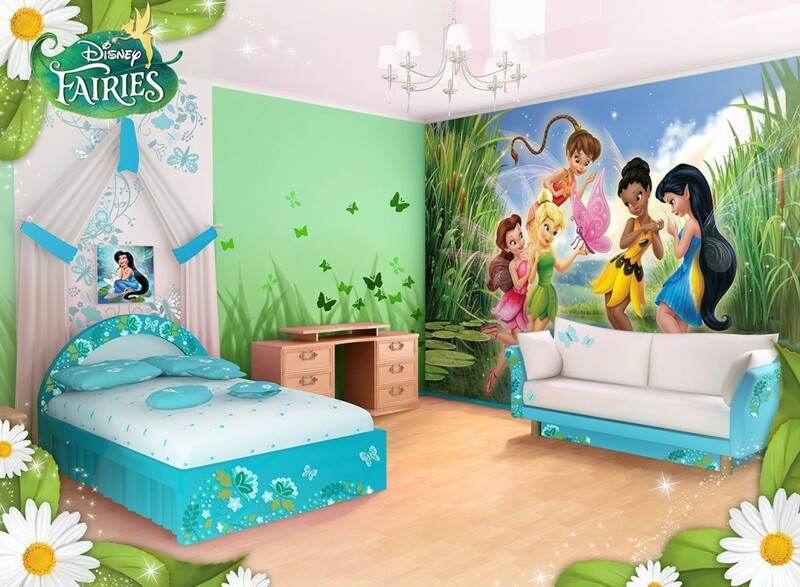 Beautiful Disney Fairies on the Lake Large Wallpaper Mural for Sale! She is telling them all about her day, flying among beautiful flowers and enjoying the wind on her delicate butterfly wings! As I said before I love how they painted the walls in a beautiful green color, but they can also be painted in sky blue. I wish I had a magical fairy bedroom too when I was a little girl! Ultra-Strippable Disney Fairies Large Pixie Hollow Mural! It looks just like a real Fairyland! The ultra-large fairies wall mural covered the whole wall plus more! *It comes pre-pasted already, but you will need to dip it in water. I have done smaller ones by myself but it can be a little messy and frustrating. 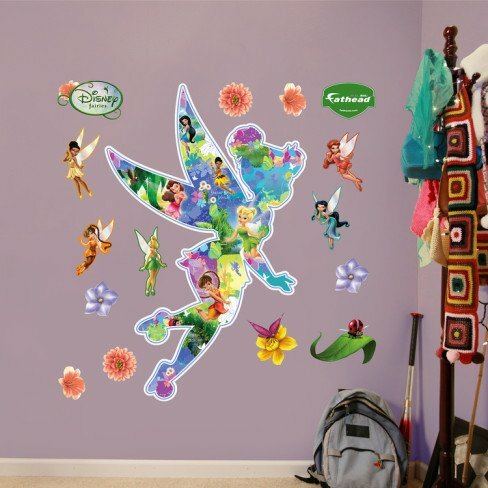 Cute Disney Fairies Wall Decal! This is by far the fastest way to create a cute fairy bedroom for your little girl! You can get as many as you want! You will get 5 cute Disney fairies who can’t wait to meet your baby girl and make friends! 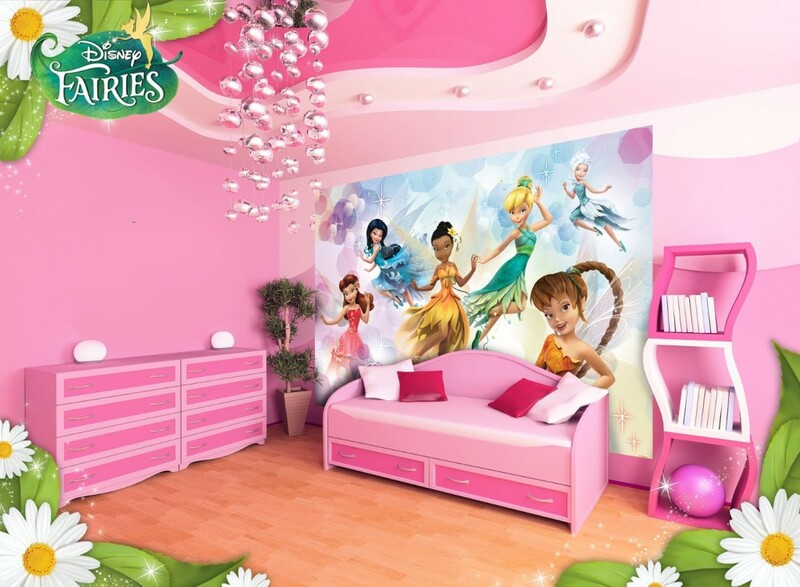 This is a beautiful and very unique Tinkerbell and her fairy friends wall decal for sale! You can create your very own ‘magical fairy corner’ in your little girl’s bedroom! Cute Love Fairy Peel and Stick Wall Decals! Look who came to bring even more LOVE to your home! *You can get her in 9 different sizes and prices! I obviously prefer the largest one available, so it will stand out! Cute Flying Fairy Wall Decal! 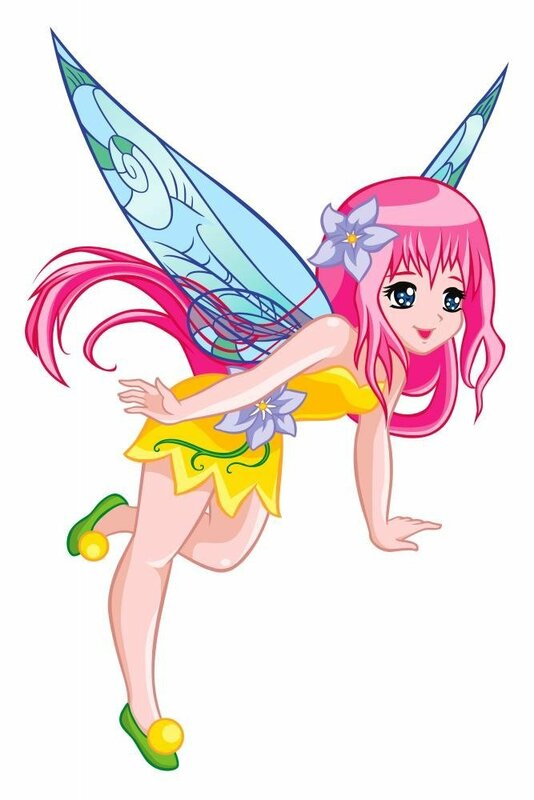 Another cute fairy with pink hair peel and stick wall decal for sale! And she is flying your way! *She is also available in 9 sizes and it’s super easy to install! 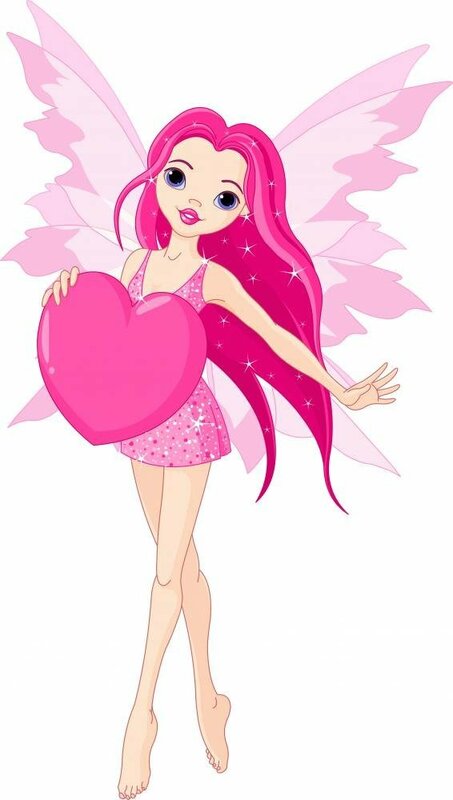 A great idea would be to get several wall decal fairies and place one on each wall! Cutest Forest Fairies Canvas Wall Mural for Sale! 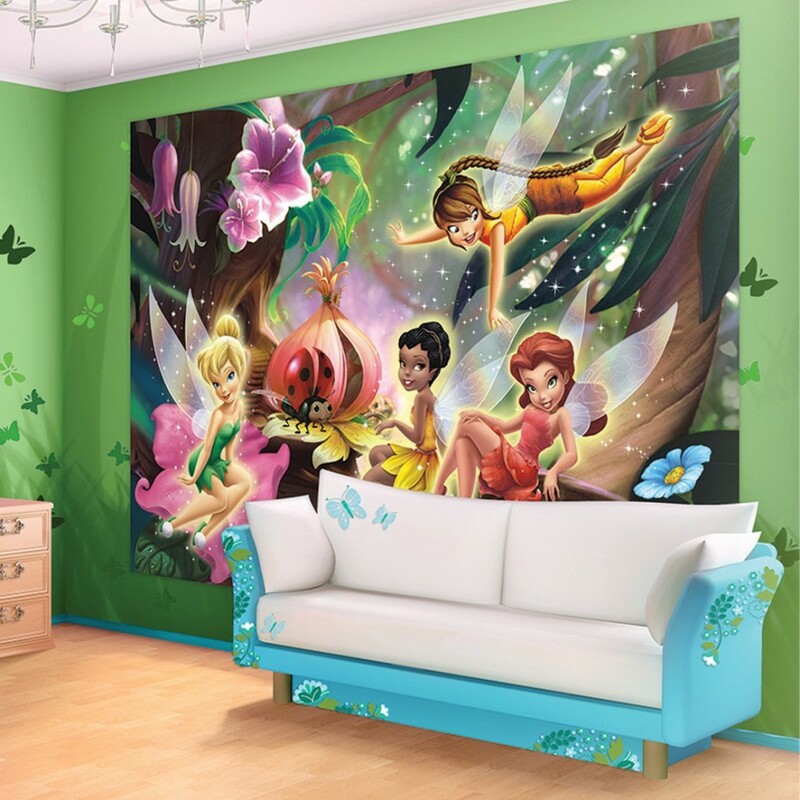 This is one of the cutest and most colorful FUN fairies wall mural for sale! The forest fairies are all playing and flying together in their beautiful Fairyland! 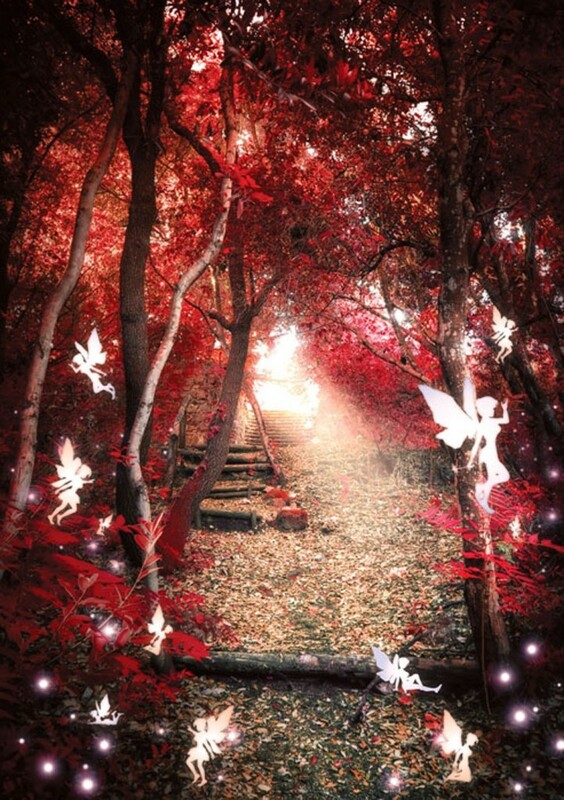 You are about to enter the real magical Fairyland forest! Can you see all the magical fairies flying around? That is a very special ability! 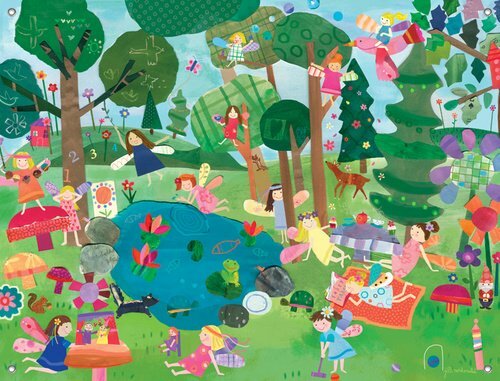 This gorgeous Fairyland wall mural will look amazing behind your bed or on a wall by itself! 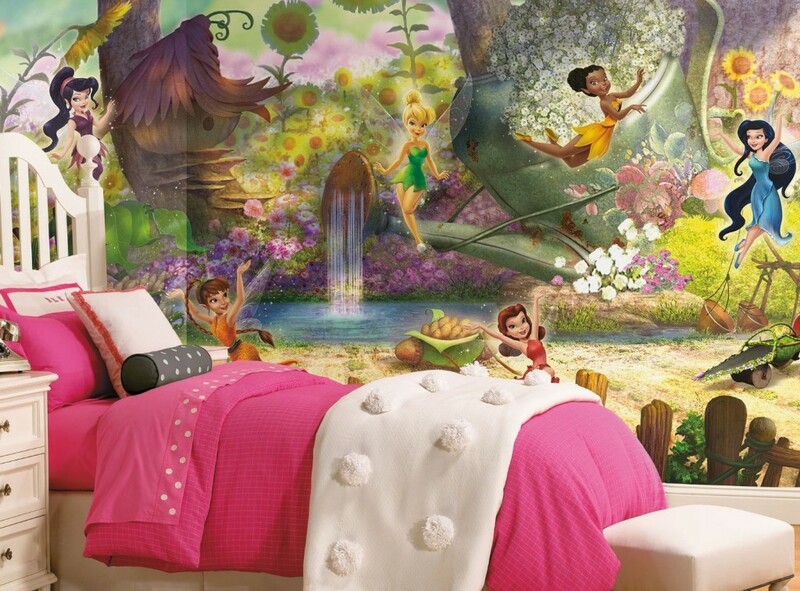 And here is another gorgeous Disney fairies flying together large wall mural for your little girl’s bedroom! 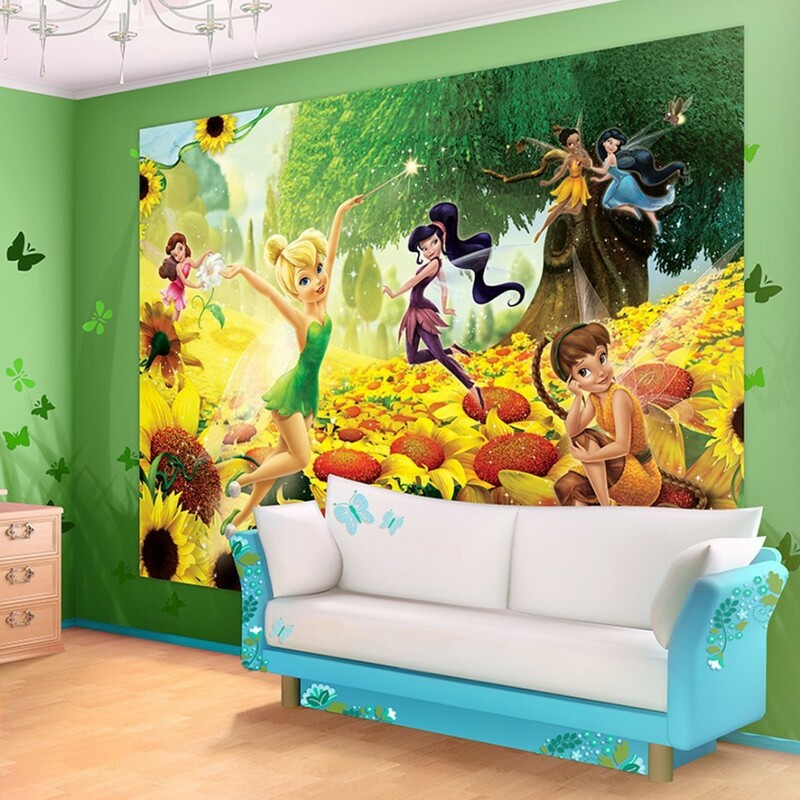 Gorgeous Disney Fairies and Sunflowers Large Wallpaper Mural for Sale! And last but not least, is this huge Disney fairies playing among the most beautiful sunflowers wallpaper mural for sale! Will definitely make your little girl’s bedroom very cheerful and happy! *More fun ideas for a girl’s bedroom!